To view 2019 syllabus, please click here. To view 2019 course details from HUJI-RIS website please click here. To enrol for 2019 course please click here. * Note that syllabus and course content is subject to change without prior notice. 60 hour interim program, conducted entirely in English. The schedule is planned to allow students sufficient time to travel around Jerusalem and discover first-hand the rich and diverse aspects of Israeli society. The team of instructors includes senior lecturers from the Faculty of Law of the Hebrew University and guest speakers in different fields. Leading academics and experienced practitioners provide students with knowledge of the basic concepts and institutional framework of Israeli law, as well as with a more practical perspective regarding the operation of the legal system on the ground. Jerusalem is a city sacred to Judaism, Christianity and Islam that has captured the hearts and minds and souls of the world for over 3,000 years. Jerusalem is a melding of past and present, of ancient roots and modern innovations. The Hebrew University is Israel’s first university and a symbol of the cultural rebirth of the Jewish nation in its ancestral homeland. The Hebrew University has become a multi-disciplinary institution of higher learning and research and a scientific centre of international repute. Mandatory attendance policy of 80% of classes and field trips. Daily course readings from course readers, including statutory law, common law and academic commentary by both Israeli and international jurists. Formal assessment at the conclusion of the course. This can take the form of a written exam and/or research essays. This requirement may vary according to home University and type of degree. Credit points towards JD, LL.B and other degree at all Australian universities are available subject to the approval of the individual university. In previous years, students have obtained credit points from the Australian National University, University of Adelaide, Macquarie University, the University of Melbourne, Monash University, the University of NSW, the University of South Australia, the University of Western Australia, Deakin University, La-Trobe University, Victoria University, University of Western Sydney, University of Southern Queensland and more. Thursday January 3rd until Thursday January 24th 2019. 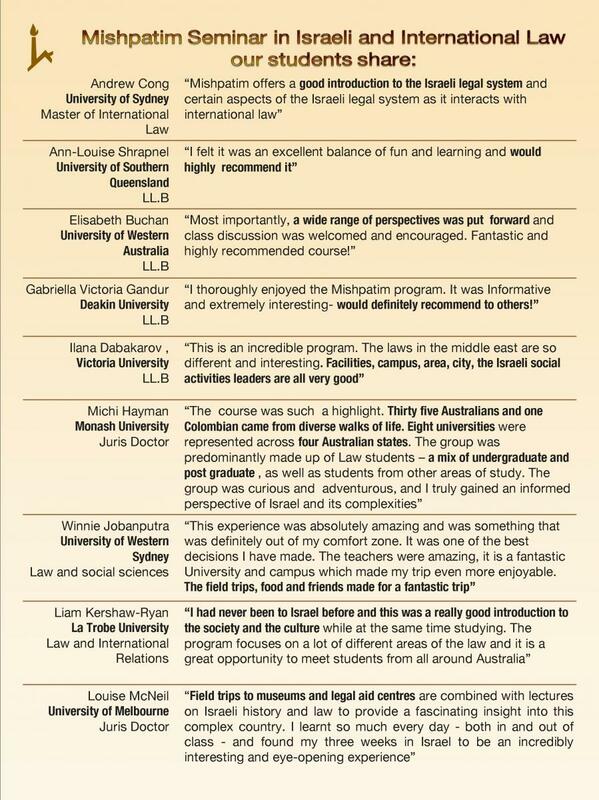 Classes are held at the Faculty of Law and the Rothberg International School. Students will be housed at the Beit Maiersdorf Faculty Club (the Hebrew University’s on-campus hotel) or at Student Village Dorms. The Australian Friends of the Hebrew University of Jerusalem provides financial assistance on the basis of academic merit, financial need or communal involvement. If you wish to apply for financial assistance, please fill out an online form here. WHO MAY APPLY: Any student who has completed at least one year of study at an Australian university in law, international relations, political science, religious studies, peace & conflict studies, as well as practicing lawyers or members of the clergy. HOW TO APPLY: online application is open and available via RIS website: https://overseas.huji.ac.il/admissions/apply-now/apply-now-summer-short-term/. Applicants should take the following steps in order to enter the Mishpatim application page: “Preliminary Questions” : Special Programs > Academic Year 2018-2019 > Mishpatim Program. The Australian Friends will be happy to contact and assist you with your application process.